Since its release in June, Inside Out has been applaud­ed by crit­ics, adored by audi­ences, and has become the like­ly front-run­ner for the Acad­e­my Award for Best Ani­mat­ed Fea­ture. Those mes­sages are smart­ly embed­ded with­in Inside Out‘s inven­tive sto­ry­telling and mind-blow­ing ani­ma­tion; they enrich the film with­out weigh­ing it down. But they are con­veyed strong­ly enough to pro­vide a foun­da­tion for dis­cus­sion among kids and adults alike. Some of the most mem­o­rable scenes in the film dou­ble as teach­able moments for the class­room or din­ner table. Though Inside Out has art­ful­ly opened the door to these con­ver­sa­tions, it can still be hard to find the right way to move through them or respond to kids’ ques­tions. So for par­ents and teach­ers who want to dis­cuss Inside Out with chil­dren, here we have dis­tilled four of its main insights into our emo­tion­al lives, along with some of the research that backs them up. And a warn­ing, lest we rouse your Anger: There are a num­ber of spoil­ers below. 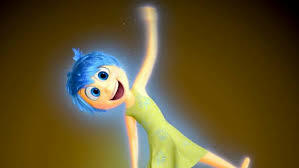 1) Hap­pi­ness is not just about joy. When the film begins, the emo­tion of Joy—personified by a man­ic pix­ie-type with the voice of Amy Poehler—helms the con­trols inside Riley’s mind; her over­ar­ch­ing goal is to make sure that Riley is always hap­py. But by the end of the film, Joy—like Riley, and the audience—learns that there is much, much more to being hap­py than bound­less pos­i­tiv­i­ty. In fact, in the film’s final chap­ter, when Joy cedes con­trol to some of her fel­low emo­tions, par­tic­u­lar­ly Sad­ness, Riley seems to achieve a deep­er form of hap­pi­ness. This reflects the way that a lot of lead­ing emo­tion researchers see hap­pi­ness. Son­ja Lyubomirsky, author of the best-sell­ing How of Hap­pi­ness, defines hap­pi­ness as “the expe­ri­ence of joy, con­tent­ment, or pos­i­tive well-being, com­bined with a sense that one’s life is good, mean­ing­ful, and worth­while.” (empha­sis added) So while pos­i­tive emo­tions such as joy are def­i­nite­ly part of the recipe for hap­pi­ness, they are not the whole she­bang. In fact, a recent study found that peo­ple who expe­ri­ence “emodi­ver­si­ty,” or a rich array of both pos­i­tive and neg­a­tive emo­tions, have bet­ter men­tal health. The authors of this study sug­gest that feel­ing a vari­ety of spe­cif­ic emo­tions may give a per­son more detailed infor­ma­tion about a par­tic­u­lar sit­u­a­tion, thus result­ing in bet­ter behav­ioral choices—and poten­tial­ly greater hap­pi­ness. For exam­ple, in a piv­otal moment in the film, Riley allows her­self to feel sad­ness, in addi­tion to fear and anger, about her idea of run­ning away from home; as a result, she decides not to go through with her plan. This choice reunites Riley with her fam­i­ly, giv­ing her a deep­er sense of hap­pi­ness and con­tent­ment in the com­fort she gets from her par­ents, even though it’s mixed with sad­ness and fear. 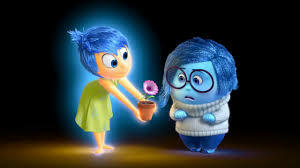 In that light, Inside Out’s cre­ators, includ­ing direc­tor Pete Doc­ter, made a smart choice to name Poehler’s char­ac­ter “Joy” instead of “Hap­pi­ness.” Ulti­mate­ly, joy is just one ele­ment of hap­pi­ness, and hap­pi­ness can be tinged with oth­er emo­tions, even includ­ing sad­ness. 2) Don’t try to force hap­pi­ness. One of us (Vic­ki) felt an old, famil­iar frus­tra­tion when Riley’s moth­er tells her to be her par­ents’ “hap­py girl” while the fam­i­ly adjusts to a stress­ful cross-coun­try move and her father goes through a dif­fi­cult peri­od at work. As a child, Vic­ki got sim­i­lar mes­sages and used to think some­thing was wrong with her if she wasn’t hap­py all the time. And all the research and press about the impor­tance of hap­pi­ness in recent years can make this mes­sage that much more potent. Thank good­ness emo­tion researcher June Gru­ber and her col­leagues start­ed look­ing at the nuances of hap­pi­ness and its pur­suit. Their find­ings chal­lenge the “hap­py-all-the-time” imper­a­tive that was prob­a­bly imposed upon many of us. For exam­ple, their research sug­gests that mak­ing hap­pi­ness an explic­it goal in life can actu­al­ly make us mis­er­able. Gruber’s col­league Iris Mauss has dis­cov­ered that the more peo­ple strive for hap­pi­ness, the greater the chance that they’ll set very high stan­dards of hap­pi­ness for them­selves and feel disappointed—and less happy—when they’re not able to meet those stan­dards all the time. So it should come as no sur­prise that try­ing to force her­self to be hap­py actu­al­ly doesn’t help Riley deal with the stress­es and tran­si­tions in her life. In fact, not only does that strat­e­gy fail to bring her hap­pi­ness, it also seems to make her feel iso­lat­ed and angry with her par­ents, which fac­tors into her deci­sion to run away from home. What’s a more effec­tive route to hap­pi­ness for Riley (and the rest of us)? Recent research points to the impor­tance of “pri­or­i­tiz­ing positivity”—deliberately carv­ing out ample time in life for expe­ri­ences that we per­son­al­ly enjoy. For Riley, that’s ice hock­ey, spend­ing time with friends, and goof­ing around with her par­ents. But crit­i­cal­ly, pri­or­i­tiz­ing pos­i­tiv­i­ty does not require avoid­ing or deny­ing neg­a­tive feel­ings or the sit­u­a­tions that cause them—the kind of sin­gle-mind­ed pur­suit of hap­pi­ness that can be counter-pro­duc­tive. That’s a cru­cial emo­tion­al les­son for Riley and her fam­i­ly when Riley final­ly admits that mov­ing to San Fran­cis­co has been tough for her—an admis­sion that brings her clos­er to her par­ents. 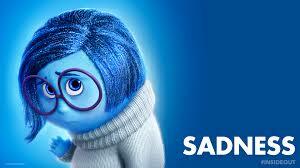 3) Sad­ness is vital to our well-being. Ear­ly in the film, Joy admits that she doesn’t under­stand what Sad­ness is for or why it’s in Riley’s head. She’s not alone. At one time or anoth­er, many of us have prob­a­bly won­dered what pur­pose sad­ness serves in our lives. In one the film’s great­est rev­e­la­tions, Joy looks back on one of Riley’s “core memories”—when the girl missed a shot in an impor­tant hock­ey game—and real­izes that the sad­ness Riley felt after­wards elicit­ed com­pas­sion from her par­ents and friends, mak­ing her feel clos­er to them and trans­form­ing this poten­tial­ly awful mem­o­ry into one imbued with deep mean­ing and sig­nif­i­cance for her. 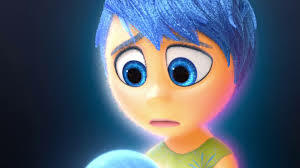 With great sen­si­tiv­i­ty, Inside Out shows how tough emo­tions like sad­ness, fear, and anger, can be extreme­ly uncom­fort­able for peo­ple to experience—which is why many of us go to great lengths to avoid them (see the next sec­tion). But in the film, as in real life, all of these emo­tions serve an impor­tant pur­pose by pro­vid­ing insight into our inner and out­er envi­ron­ments in ways that can help us con­nect with oth­ers, avoid dan­ger, or recov­er from loss. One caveat: While it’s impor­tant to help kids embrace sad­ness, par­ents and teach­ers need to explain to them that sad­ness is not the same as depression—a mood dis­or­der that involves pro­longed and intense peri­ods of sad­ness. Adults also need to cre­ate safe and trust­ing envi­ron­ments for chil­dren so they will feel safe ask­ing for help if they feel sad or depressed. 4) Mind­ful­ly embrace—rather than suppress—tough emo­tions. At one point, Joy attempts to pre­vent Sad­ness from hav­ing any influ­ence on Riley’s psy­che by draw­ing a small “cir­cle of Sad­ness” in chalk and instruct­ing Sad­ness to stay with­in it. It’s a fun­ny moment, but psy­chol­o­gists will rec­og­nize that Joy is engag­ing in a risky behav­ior called “emo­tion­al suppression”—an emo­tion-reg­u­la­tion strat­e­gy that has been found to lead to anx­i­ety and depres­sion, espe­cial­ly amongst teenagers whose grasp of their own emo­tions is still devel­op­ing. Sure enough, try­ing to con­tain Sad­ness and deny her a role in the action ulti­mate­ly back­fires for Joy, and for Riley. Lat­er in the film, when Bing Bong los­es his wag­on (the scene described above), Joy tries to get him to “cog­ni­tive­ly reap­praise” the sit­u­a­tion, mean­ing that she encour­ages him to rein­ter­pret what this loss means for him—in this case, by try­ing to shift his emo­tion­al response toward the pos­i­tive. Cog­ni­tive reap­praisal is a strat­e­gy that has his­tor­i­cal­ly been con­sid­ered the most effec­tive way to reg­u­late emo­tions. But even this method of emo­tion reg­u­la­tion is not always the best approach, as researchers have found that it can some­times increase rather than decrease depres­sion, depend­ing on the sit­u­a­tion. Toward the end of the movie, Joy does what some researchers now con­sid­er to be the health­i­est method for work­ing with emo­tions: Instead of avoid­ing or deny­ing Sad­ness, Joy accepts Sad­ness for who she is, real­iz­ing that she is an impor­tant part of Riley’s emo­tion­al life. Emo­tion experts call this “mind­ful­ly embrac­ing” an emo­tion. What does that mean? Rather than get­ting caught up in the dra­ma of an emo­tion­al reac­tion, a mind­ful per­son kind­ly observes the emo­tion with­out judg­ing it as the right or wrong way to feel in a giv­en sit­u­a­tion, cre­at­ing space to choose a healthy response. Indeed, a 2014 study found that depressed ado­les­cents and young adults who took a mind­ful approach to life showed low­er lev­els of depres­sion, anx­i­ety, and bad atti­tudes, as well as a greater qual­i­ty of life. Cer­tain­ly, Inside Out isn’t the first attempt to teach any of these four lessons, but it’s hard to think of anoth­er piece of media that has simul­ta­ne­ous­ly moved and enter­tained so many peo­ple in the process. It’s a shin­ing exam­ple of the pow­er of media to shift view­ers’ under­stand­ing of the human experience—a shift that, in this case, we hope will help view­ers fos­ter deep­er and more com­pas­sion­ate con­nec­tions to them­selves and those around them. – Jason Marsh is the edi­tor in chief of Greater Good, an online mag­a­zine based at UC-Berke­ley that high­lights ground break­ing sci­en­tific research into the roots of com­pas­sion and altru­ism. Vic­ki Zakrzews­ki, PhD, is the edu­ca­tion direc­tor of the Greater Good Sci­ence Cen­ter.